Throughout the Games, we’ll be tracking social conversations around the 2014 Sochi Olympics in this daily infographic to show what’s buzzing on social. Powerful stats from uberVU via HootSuite will be updated each day to give you an overview of who owns the mindshare of Olympic voice on social. This volume focuses on the cultural topics dominating Olympics discussions on social media. Read on for a deeper dive into these stats. Social media users are loving former Olympic figure skater-turned-commentator Johnny Weir’s daily Instagrams and Tweets showcasing his Sochi wardrobe. Though Weir, who is openly gay, has denied his fashion choices are a political statement, many have interpreted his clothing choices as a symbolic act of protest. Whether or not that is the case, Weir is ruling social media with over 15,000 mentions, many of which mention the key terms “outfits,” “fashion,” and “fabulous.” Most of those have also been positive or neutral, at 42% and 50% respectively, while only 9% of mentions were considered negative. What would a social media trend be without an associated selfie hashtag? Enter #SochiSelfie. Athletes competing in Sochi have been taking self-portraits and tagging them #SochiSelfie, spawning an Olympic-sized trend. Shots include event courses and arenas, the athletes’ medals and the Jamaican Bobsled team. Snapping a shot with the popular bobsledders has become somewhat of a contest among the athletes. Overall the trend was not a controversial one, with 91% of the approximately 4,200 social mentions being neutral in sentiment. Many in the social media community have likened the Sochi Olympics to another timely cultural trend: The Hunger Games. This comparison has surfaced for a few reasons, including the dramatic and futuristic aspects of the opening ceremonies and Russia’s current battle over human rights. Activists have even released a video entitled “Olympic Hunger Games: Sochi” highlighting the Russian government’s oppression with a tongue-in-cheek reference to the novel trilogy. Did we miss an Olympic cultural trend? Let us know in the comments. 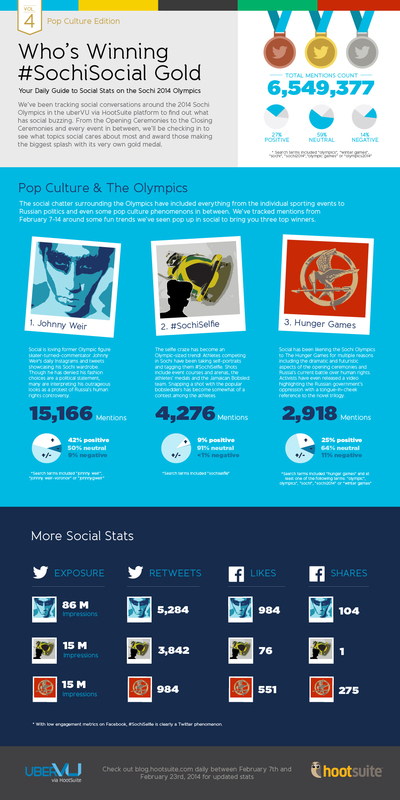 For Volume 1 of the infographic, on the start of the Games, click here. For Volume 2 of the infographic, on Opening Ceremonies, click here. 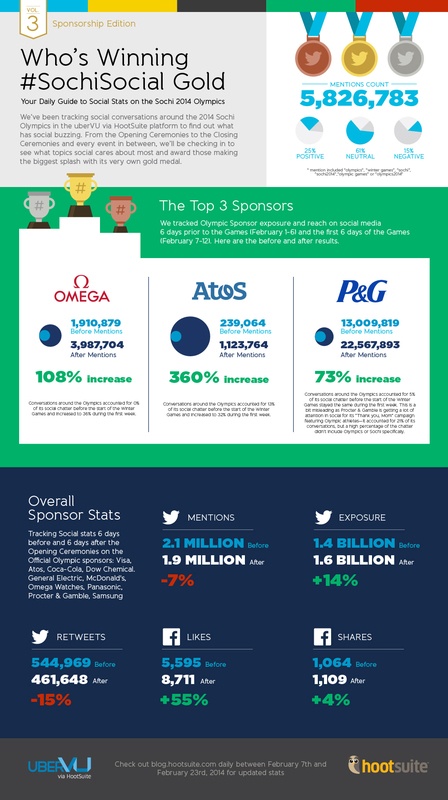 For Volume 3 of the infographic, on Olympic sponsors, click here.